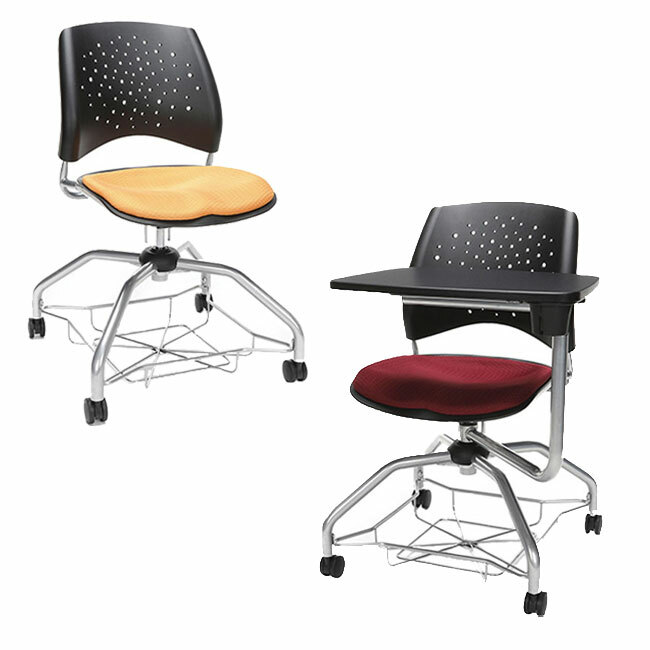 The 21st century learning center needs a 21st century classroom student chair and that's what you get with the Stars Series Foresee Student Chair by OFM! Based on the 4 C's of Education (Collaboration, Communication, Creativity, and Critical Thinking), this chair incorporates those elements with several innovations such as a triple seat curve seat 8design, 360° swivel function, and extra thick curved back with lumbar support, this student chair is perfect for the constantly-changing modern learning environment. The seat cushion is not only plush and comfortable, it is also replaceable which adds long-term utility to the seat while also being anti-microbial to keep germs away! The silver powder-coated finish on the frame creates a welcoming and adaptive visual while the under-seat basket keeps books, laptops, and school supplies with an arm's reach.